Omnetics has a rich history of designing and manufacturing rugged high performance connectors, cable assemblies, and wire harness solutions for high-reliability applications. Our lightweight miniature and ultra-miniature connectors are known for their high reliability, quality, signal integrity, and performance in extreme environments. 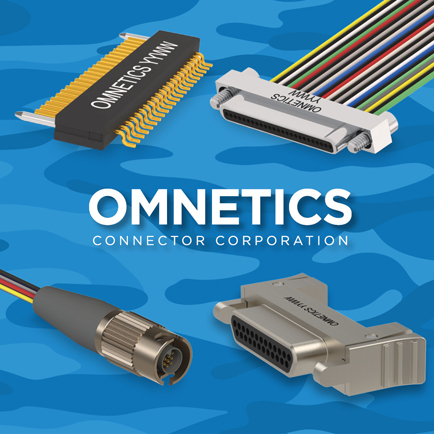 Omnetics’ Mil-Spec based Micro-D, Nano-D, Circular, Hybrid, strip/PCB board connectors, Ethernet, and USB connectors are used in applications requiring high quality, along with reduced weight and size interconnect technology. Defense & security, aerospace, space, industrial instrumentation, and petroleum exploration markets utilize connectors from Omnetics. Omnetics continues to develop connector solutions to address the design engineer’s need to minimize space, reduce weight, and maximize performance in their devices used in dismounted soldier, satellites, C4ISTAR technologies, and unmanned systems programs that meet the need for reliable and safe operations. Micro and Nano connectors utilize Omnetics’ exclusive Flex Pin contact system, which includes gold-plated beryllium copper contacts that can withstand a wide range of temperatures, high shock, and over 2,000 mating cycles. Micro connectors transmit 3 amps per contact and are spaced at 1.27mm pitch, whereas Nano connectors transmit 1 amp per contact and are spaced at .64mm pitch. Omnetics’ products are designed and assembled in Minneapolis, Minnesota and utilize in-house automatic machining and over-molding equipment. For more information, visit our website at www.omnetics.com, contact sales, or view our catalog.